Will be putting here stuff related to road traffic, especially cycling. Also material related to "Better Junctions" programme of TfL. Also referred to as "Cycle Segregated Junctions"
This is a safe design for light-controlled junctions developed by London Cycling Campaign's Junction Review Group. It eliminates Left Hooks and provides single stage pedestrian crossings. A few HtL junctions have now been implemented in London. It is hard to find information about this design so have tried to bring material together here. Just follow this link. Elephant and Castle Northern Roundabout. 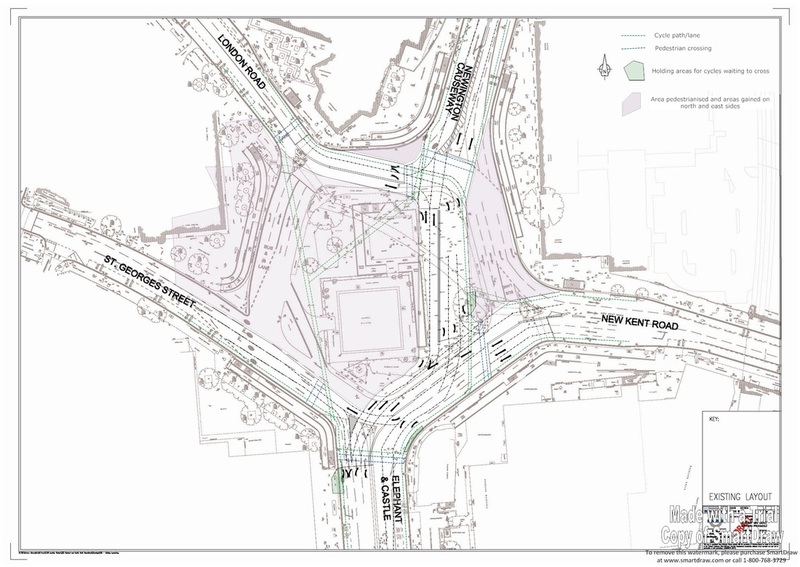 The LCC's Junction Review Group have generally welcomed the more detailed information about plans for "peninsularising" the northern roundabout. However, there are still lots of left hook problems, particularly for northbound cyclists. 1. Remove general through traffic from St George's Rd; return London Road to 2-way instead. 2. Provide a shorter the Eastern Bypass by using Elephant Rd. 3. Provide a direct northward route for cyclists from the Link rd to Newington Causeway. I have put details in a blog so that people can comment. We had a look at this for the JRG meeting in January 2013. How about doing away with the roundabout and going to a big t-junction? See scheme below and my 2 documents analysing traffic at the E+C. Also have a look at Charlie Holland's alternative here. An analysis of past, present and future trends. And some thoughts on priorities to cope with the impressive increases in cycling in this network of main roads. Did you know cycling numbers along Jamaica Rd have increased 800% in the last 11 years? Did you know cyclists now outnumber ALL motorised traffic (including motor cycles) at peak hours?